"What a GREAT experience! Once again John and his team did a great job of diagnosing the problem and repairing it affordably. I appreciate the genuine work ethic and personal integrity that makes the budget a priority when determining the best resolution. They makes every effort to provide excellent care for customers and their vehicles." An exceptional general auto repair shop in Covina, Hye-Tech Auto's team of friendly, experienced auto mechanics are dedicated to keeping customers on the road safely, affordably and conveniently. We'll keep your new car warranty valid while saving you money on the cost of expensive dealership service departments. We perform all auto repair and vehicle maintenance services on all types of vehicles including BMW and Mercedes, including brake repair, transmission repair, engine diagnostics, oil changes, clutch replacements, engine rebuilds, timing belts, Carmax Services and Maintenance and much more. Call Hye-Tech Auto at ((626) 332-5452 today! From minor maintenance to major repairs, our team of experienced mechanics are ready to serve your needs. We are a small shop with a BIG heart and understand that auto repair is not cheap. We promise to make sure you get the best price and a job well done for your money. Whether your needs are just a simple oil change, or something more intensive such as an engine overhaul, transmission repair, computer diagnostics, or suspension repair. 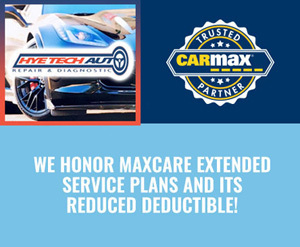 If you have a CarMax warranty, we are a certified CarMax repair facility! Bring your vehicle in and get warranty repairs done here! We are ready to work for you! We offer old-fashioned service with the latest technologies and techniques to deliver outstanding results to our customers. Our unwavering commitment to customer service includes free tire pressure and fluid checks, free check engine light diagnostics, and we provide free auto repair estimates in Covina and the surrounding area. From regular oil changes to complete engine overhaul, trust the certified professional auto mechanics at Hye-Tech Auto to deliver reliably honest and friendly auto repair service. Our goal is to perform quality auto service and repair that keeps your car running smoothly and avoids costly repairs down the road. We're a BBB accredited business with extensive positive reviews from our customers online, so for your next auto repair, oil change or other auto maintenance service, trust the experienced auto mechanics at Hye-Tech Auto repair shop in Covina! "Honest people. Hye-Tech is an excellent place to go for car repair because they provide an estimate of the repair cost, they're reasonably priced and the repairs are speedy. I don't feel they take advantage of customers, and I'll continue to do business with them." 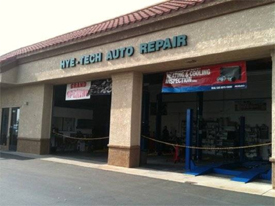 "Hye-Tech Auto is my auto repair go-to place. I can honestly say they won't do anything sketchy or anything to rip me off, and it's good pricing for the quality they provide. I absolutely recommend this place. :)"
"John was very thorough in discussing my repair options and helping me make the right decision - not paying for items I really didn't need. I'll be baaaaaccckkkk!" Call (626) 332-5452 Today for an Appointment!